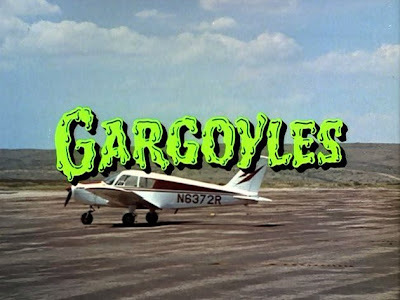 In Bill Norton's made-for-TV movie Gargoyles (1972), written by Steven and Elinor Karpf, the human race encounters a very old enemy: Gargoyles...the monstrous spawn of Satan himself. The production values are minimal, and the Gargoyle costumes -- often shown in fully-revealing slow-motion photography -- perhaps don't hold up particularly well in 2012. And yet, the movie casts a powerful and sinister spell despite such concerns. It is also clearly of the age of "social critique" genre films such as Conquest of the Planet of the Apes (1972), wherein a group/cadre of non-human characters symbolize some element or component of real life in contemporary America. In many crucial ways, the first half-hour of the film, in which the Gargoyles are not fully seen, sets the macabre, unsettling tone for the picture. We follow an anthropologist, Dr. Mercer Boley (Cornel Wilde) and his halter-top wearing daughter, Diana (Jennifer Salt), into a barren desert as they visit a crazy old coot, "Uncle Willie" (Woody Chambliss). Willie claims to have made a discovery of some scientific significance, but wants to show it to the Boleys, not merely tell them about it. In these early moments, Gargoyles generates a mounting sense of dread and foreboding as Norton's camera adopts high angle shots of great distance. From a viewpoint high atop ancient rocks and outcroppings, we watch the Boley station wagon traverse, essentially, nothingness. Later, Willie reveals to the Boleys a Gargoyle skeleton he found in the desert and has meticulously re-assembled..and then the first Gargoyle attack arrives in a flash. We see slashing claws break through a metal shed wall, and all Hell breaks loose. The Boleys manage to escape (Willie is not so lucky...) and they flee in their car. Again, a Gargoyle attacks, and nearly destroys their vehicle. 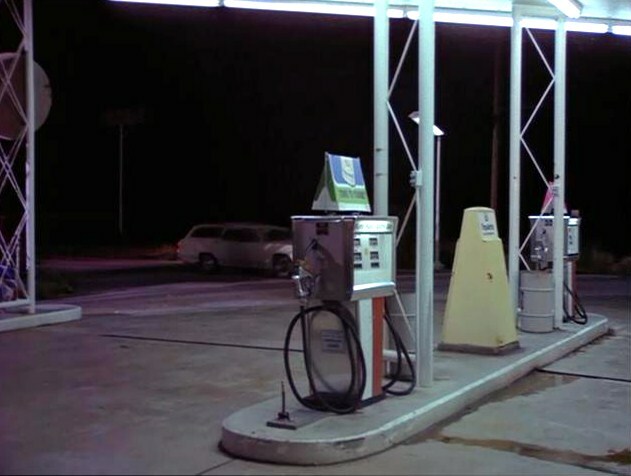 The Boleys make it to a lonely gas station by thick of night, and the sensations of emptiness and vulnerability are pretty powerfully rendered once more. Our protagonists are surrounded by darkness on all sides of this lonely outpost, and you can just imagine that they are being closely observed by the monsters,who are conveniently obscured by blackness. In its short running time, Gargoyles is filled with moments such as the one I describe above, at the gas station at night. 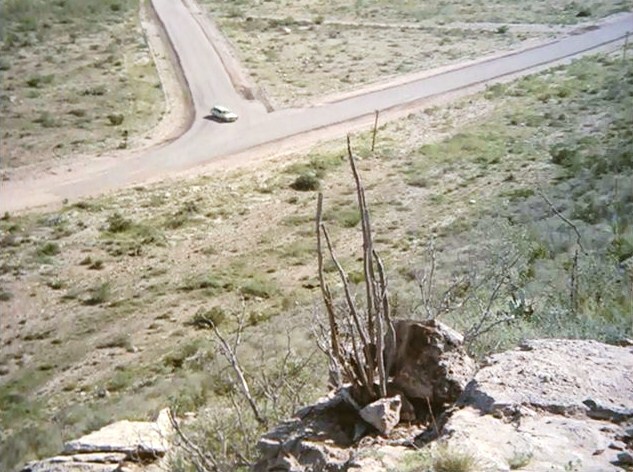 Later on, Diana walks along a desert road by herself, on the way to a police station, and she's the only soul in sight. I suppose the creepy success of Gargoyles is a testament, in part, to effective location work and choice in setting. 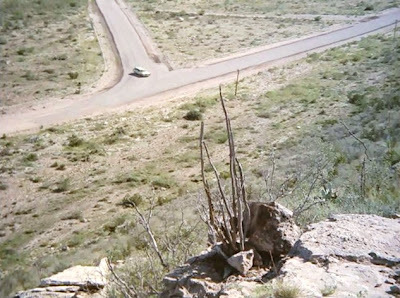 Director Jack Arnold often utilized the desert background to great effect in his genre films, and that's the same trick Gargoyles pulls off. Almost immediately, the film disarms the viewer with a powerful sense of place, and the impression of a malevolent intelligence working behind the scenes. When the monsters do finally take center stage, the film shifts into a different gear all-together. The slow-motion photography that frequently showcases the beasts is perhaps a double-edged sword. On one hand, it gives the creatures a kind of "alien" or unfamiliar sense of movement and grace, and grants their monstrous footsteps a level of gravitas. They seem to move according to their own laws of nature. On the other hand, the slow-motion photography also reveals, fully, the costumes. Gargoyles (deservedly) won an Emmy for its special effects, but fully-costumed, head-to-toe monsters are hard to vet well, especially if you show them (well lit) so frequently. The masks/make-ups by Stan Winston and Ellis Burman remain exquisite, but in some cases -- probably because of superior DVD clarity -- you can make out that the Gargoyles seem to be wearing tights/pants. 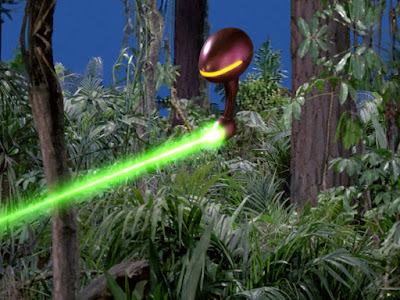 You shouldn't let this inhibit your enjoyment of the movie, however. For the latter half of Gargoyles proves effective, and unsettling by developing the character of the lead Gargoyle, a sinister but intriguing character played by Bernie Casey and given vocal, icy life by Vic Perrin, the Outer Limits "Control Voice." There's a malevolent, clever intellect at work in this Gargoyle's voice and dialogue. He is truly a monster to be reckoned with. He's not merely a dumb brute or savage beast, but an intelligent, curious, and yes, often diabolical being. Late in the film, for instance, the Gargoyle captures Diana and forces her to read human books to him, so he can gain an increased understanding of his enemy. There's a definite Beauty and the Beast vibe happening here, and in one suggestive moment, Diana reads the diary of a woman from 1417 AD who was visited in her bedroom --and seduced -- by a Gargoyle. Nothing remotely physical or sexual actually occurs between the Gargoyle and Diana in the film, but this scene scintillates with danger, uncertainty, curiosity, and the undercurrent of forbidden sexuality. In one provocative moment, the Gargoyle approaches Diana, probing aggressively into her physical space, and informs her that he is "curious" about her. If this admission from the Gargoyle is coupled with the scene of his first approach -- wherein he caresses an unconscious Diana and seems to cover her prone body with his own -- the idea of forbidden "attraction" between Gargoyle and human seems inescapable. And make no mistake, in some weird, twisted way, the Gargoyle is a beautiful, regal and even attractive creature. He has dignity, poise, stature...and icy intelligence. And that description, of course, fits the very nature of evil as we sometimes understand it: it sometimes carries a wicked, seductive allure. Here, the mystery of the Evil "Other," is quite powerful, and the scenes between Diana and the Gargoyle compensate for some of the less-than-overwhelming heroics that dominate the last few minutes of the film. Also noteworthy about Gargoyles is the film's sense of imagination regarding Earth's "secret history." 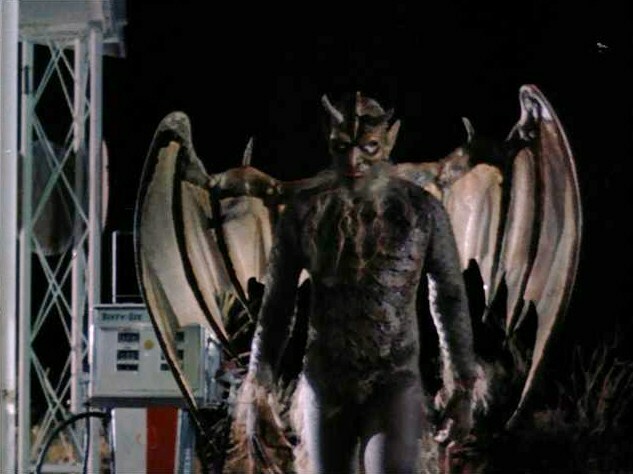 The film suggests that man and Gargoyle have been locked in a war over the generations, and that the Devil's children are real, and perhaps possess an equal and rightful claim to the Earth. Even more than that, there are points in the film, including the climax, wherein Dr. Boley reveals compassion for the Gargoyles. Early on, when a Gargoyle is struck dead in the street by a passing truck, Dr. Boley notes that it seemed afraid, just like a human being would. I find this degree of sympathy for "the monster" an endlessly fascinating touch, because the voice-over narration at film's commencement establishes, without a doubt, that the Gargoyles are born of Evil, and therefore evil themselves. Yet when we meet the Gargoyles, we immediately recognize such human characteristics as pride, lust, and even the survival instinct. Can we treat the enemies of mankind with compassion? Is this actually sympathy for the devil? Thus Gargoyles forges the subtle argument that just because one is born of evil does not mean that such evil must be one's destiny. The Gargoyles can choose to be different, perhaps. I wonder, do they possess the same "free will" as man? 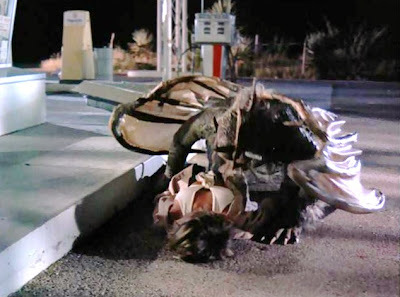 Regardless, in allowing the Gargoyle and his winged mate to escape, Dr. Boley saves his daughter's life. But has he also assured, through his behavior that -- at some juncture -- a truce is possible between these two races? Read a little deeper however, and I suspect, on some level at least, that Gargoyles is actually a horror treatise concerning race and race relations in America. For instance, there's the specter of forbidden love between a white woman and "monster" here (as well as the concurrent mythologizing of the ethnic "Other" as a kind of sexual Goliath). The diary speaks of the seduced woman's frenzy, but does not make clear if that frenzy is terror, sexual, or some unique (and pleasurable?) combination thereof. In Gargoyles, you also see the idea of a separate ethnic group existing within our national borders, seeking to redress past wrongs. And as the lead Gargoyle states, this is the end of "our age" and the beginning of his. In Gargoyles, there is also a well-recorded history of animosity between the two peoples, but also an acknowledgment that in terms of our desires and characteristics, humans and Gargoyles are very much the same creature. We both fear death. We both possess "desires." We both love our young. In America, alas, we have also witnessed a long and ignoble tradition of people referring to other ethnic groups as Satan's representatives on Earth, and this real life parallel casts the film in a new light. If Gargoyles -- children of evil -- and humans can achieve a rapprochement, what's to stop us from healing racial divisions among our own kind? When Boley lets the Gargoyles go free in the climax rather than burning them in their egg chamber, he is striking a blow, perhaps, for racial justice. He's turning the page on an age old animosity, and re-setting the state of human/gargoyle relations for a more positive future. Again, the closest parallel I can think of here is Conquest of the Planet of the Apes, which positioned the apes, essentially, as a derided, mistreated ethnic minority. An in-depth discussion of Gargoyles reminds me that in the 1970s, our pop culture often examined things from a somewhat more nuanced and even-handed place than it does today. Here, rather than render an entire race extinct, Boley reveals the human qualities of mercy and hope. In today's genre films, he unlikely would be so forgiving. Rather, he would probably wipe out the Gargoyles without a a second thought. They are monsters. Man kills monsters. Period. Anyway, there's much more to Gargoyles than meets the eye. It's an ambitious and heady effort for a "movie of the week" made in 1972. That's one reason it still possesses an avid cult following, I suspect. I saw it for the first time as a child in the late 1970s -- around the same time I saw Don't Be Afraid of the Dark, I suppose -- and it terrified, intrigued, and fascinated me. Gargoyles still has that effect on me, all these years later. My parents didn't let me finish watching this movie when it originally aired, but the prospect of what was out there in the desert haunted my childhood imagination for years. John excellent review. I saw Gargoyles(1972) as a young boy in '72 with my family. I never forgot it. For me it still holds up like Jaws(1975), basically a '70s masterpiece. The setting makes me believe it is an allegory Native Americans being displaced by the European settlers. The diary of a woman from 1417 A.D. reminds me of the 1800s events of the Night Gallery "Pickman's Model" episode. John excellent review. I watched Gargoyles(1972) as a young boy in '72 with my family. I never forgot it. For me it still holds up like Jaws(1975). Both '70s era masterpieces. The setting makes me believe it is an allegory for Native Americans being displaced by the European settlers. The diary of a woman from 1417 A.D. reminds me of the 1800s events of the Night Gallery "Pickman's Model" episode. Lord knows, I miss the good old days of made for TV Horror (well, quality Horror). Agree, made for TV horror movies were great.